I crave vegetables but it’s not always easy making sure I’m eating enough of them. Smoothies are my way of making sure I get more fruits and vegetables in my diet. This has been especially important to me lately. My father underwent triple bypass surgery recently so I’m on a mission to Eat The Rainbow. Basically that means that I eat a minimum of three different colors every day. I find that if I start the day off by getting at least one or two colors in my belly then it’s a lot easier for me to reach my colorful goal. This approach has also helped me keep the fridge clean. If a banana is starting to go, I toss it in the blender. Same with leafy greens. On this day I tossed a handful of kale, 1/2 a frozen banana, 1/3 cup Cabot Vanilla Greek yogurt, splash of OJ and some fresh ginger into the blender. It was really, really good. The ginger made all the difference. Mark even tried it and said, ‘not bad’. Trust me, from him that IS a ringing endorsement. 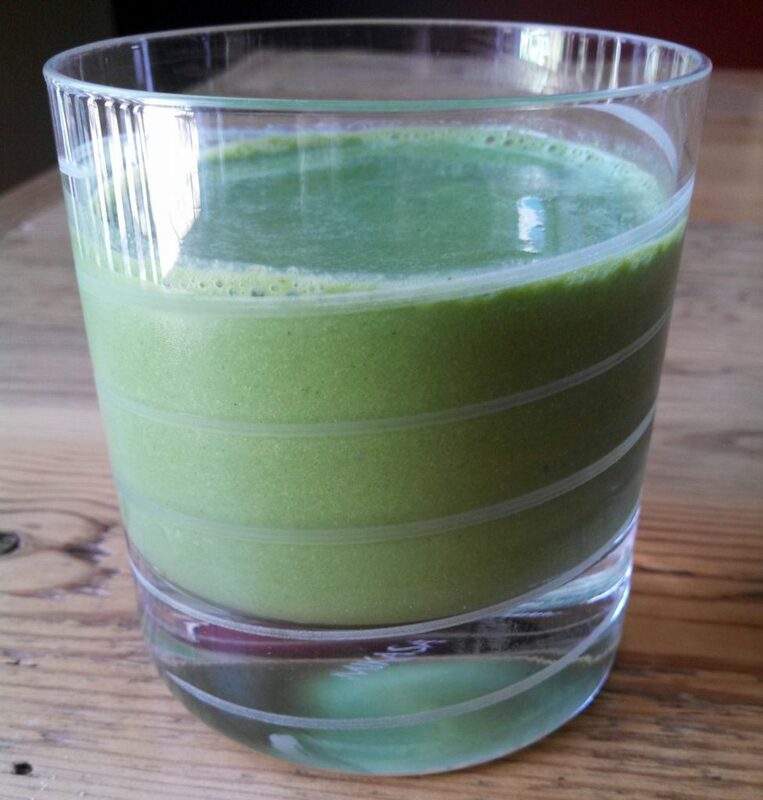 Just don’t give green smoothies with raw leafy things to kids, the elderly or the infirm. Sometimes (even in triple washed bagged greens) there are some nasty things lurking on those greens. Proper cooking will kill any erant bacteria, but smoothies like this have caused irreparable harm. We can’t live our lives in fear, and most of us get behind the wheel of a car daily. But for me–in the parlance of our times–the juice isn’t worth the squeeze. We eat a LOT of leafy greens in their raw state in the form of salads and on sandwiches. So far the benefits have outweighed the risks. I have found that purchasing as much as I can locally, growing my own and doing my best to use organic produce helps minimize the risk. That being said,I hear ya and appreciate you sharing this tip with me and my readers.